Searing summer temperatures have put my high mountain walks on hold but it wont stop me from visiting a few shorter routes where I wont need a fully stocked fridge and a hosing down every few minutes. 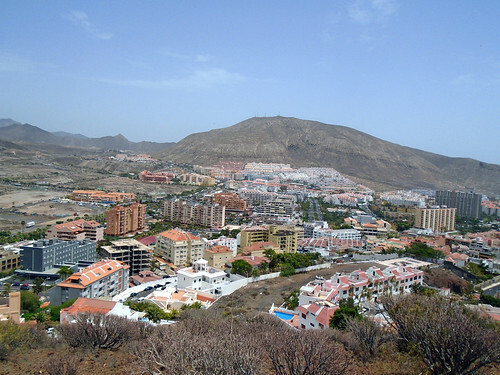 So there I was a trifle sweaty and on top of Montaña Chayofita overlooking my favourite sizzle spots on the beaches of Los Cristianos. 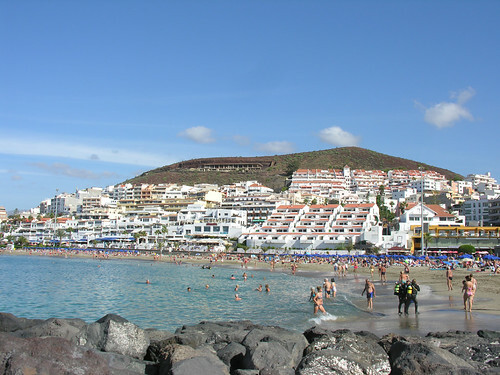 With schools closed and the annual search for sunshine well underway packages for Tenerife holidays were filling the hotels and apartments that fanned out to either side of my downward vision. It only took a cautious 20 minutes to take the smaller track up the side of Chayofita, I could have followed the old road base to the white markers and peeled off there but decided to do a full circle from the opposite direction. The usual unanswered questions flashed through my brain, how did anyone get building permission or start without it and not get noticed. Chayofita is supposedly protected land and the half finished grand home has been frozen in time for at least 15 years, people are squatting in there, the previous evenings torrential rain must have shaken them up a bit. 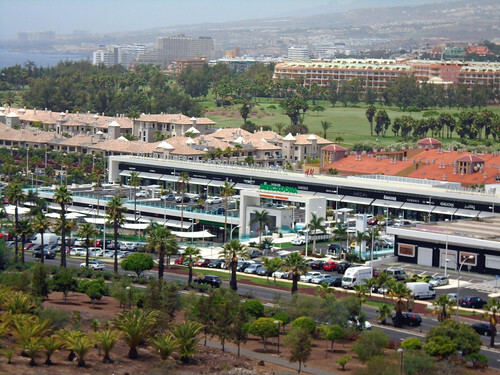 I had plenty to think about as I made the short descent, the views keep changing, Parque Santiago 6 shopping centre was a recent addition below and I could just make out the Tower of Power at Siam Park in the distance. 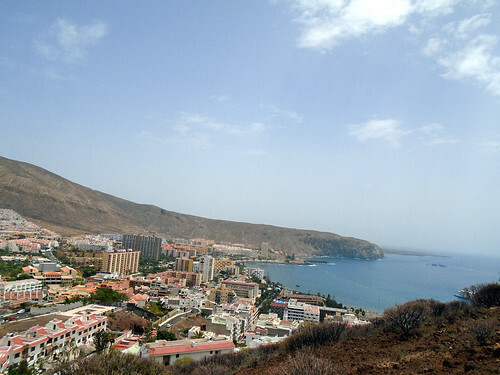 Cresting the crown I had a lovely view up the bypass to the centre of town and beyond to the side of Montaña Guaza and the ridge sloping down to the sea, that’s a more serious hike that I have done many times. I was surprised to see the wooden bench on the top of my mini mountain was no longer in place, not that I was planning to take root. 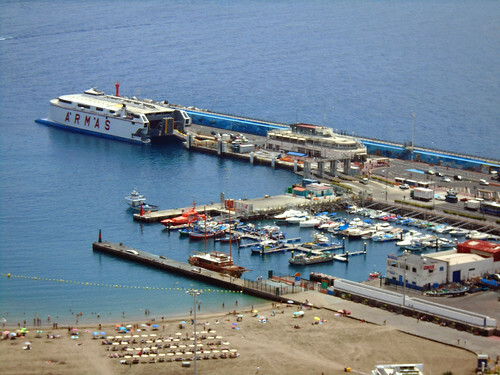 The marina and the ferry port looked quiet as the Armas ferry slumbered before another inter island crossing, even the old beach look fairly sparse for such a hot day. Las Vistas was busier, I was already anticipating a cooling swim in the sea as I started to descend down the other side into the collapsed centre of the volcanic cone. There was a little rough shack nestled in the lower fold of the track down, a lot of people are scraping by as and where they can these days. 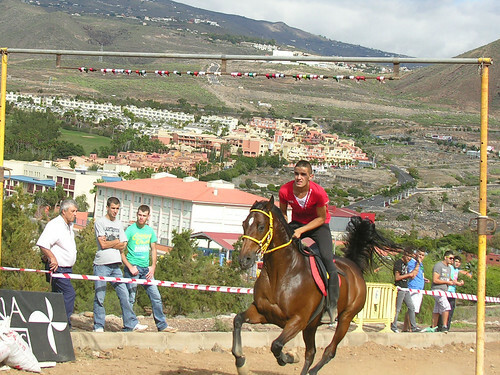 As I passed through the white markers to the early attempt at a road, I thought about the Sortija de Caballos I had seen nearly two years ago as mounted marksmen on horses galloped up the road and tried to grab small metal rings suspended on overhead arches. Oh well this old horse was back at ground level and took a short cut through to the beach for a long dunk followed by a nose bag at a local bar.